We’ve developed quite a thing for artist duo JF Pierets. 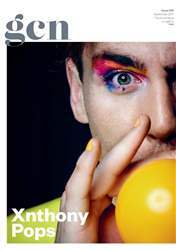 Not only do the Spain-based couple own the gorgeously flamboyant queer mag, Et Alors? (for which they posed on the very first cover – pictured), but they’re about to embark on an epic politically queer performance piece like no other..